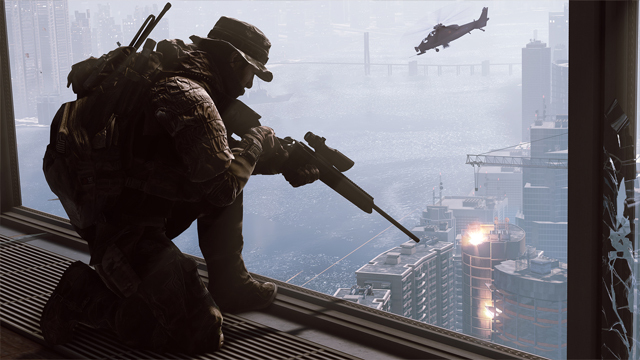 Battlefield 4 offers "most personal weapon customization ever"
Weapon camouflage has been fine-tuned to add an even more personal touch to our new arsenal. DICE has added new camos such as Autumn, Desert, Naval, Snow, Urban and Woodland as well as an abundance of other new camouflages. These will come in 16 different types of patterns. However, no word as of how you will be able to unlock them, yet. In addition, "Adaptive Camouflage" will allow certain paints to fuse in with the environment you are currently located in. If you love to sit back and pick off enemies one by one as the Recon class, you will now be able to calibrate the distance of where the enemy is. "When aiming at a remote enemy you can estimate the distance to your target. After you've figured out if your prey is 200, 500 or maybe even 1,000 meters away, you can calibrate your scope to compensate for the bullet drop that comes with long range shots. Zeroing your scope is an advanced technique and won’t make you perform perfect headshots every time, but for those skilled enough to approximate distance it will be a welcome strategic addition." I believe this is perfect add-on especially if you love and mastered the aspect of Battlefield 3 sniping. You will now have the ability to pick-up weapons on a particular area of the map. "Battle Pickups" are designed to turn the tide of battle and also to give it a refreshing appeal to gameplay. The location around the pickups will become an area of interest; so if you fancy a .50 Cal sniper, don't let the enemy beat you to it!